Having all your “company” documents (files, forms, new employee documents, OSHA & safety documents) in one place is great! But HRSoftware.me also allows you to keep employee specific documents organized and available as well allowing you and your employees access which could lead to a paperless office. Add to that built in E-Signature and you have a complete system. 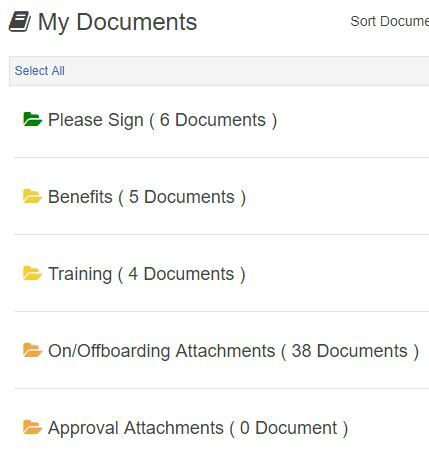 From Benefit documents, New Hire documents, Performance Reviews, Disciplinary records, Policies, Attachments, you name it, they can all be stored in your custom installation of HRSoftware.me. You can even organize your documents by category or filter the view so finding documents is easy! And relax, permissions and security are built in! HRSoftware.me gives you the ability to control who has access to files and documents so the time saved by your employees and managers being able to have “Self Service Access” to the documents they need without bothering your HR department creates better inter-company communications saving time, energy and money for all. No more wondering who has what documents and where! You can reach your important documents from anywhere! Need a form quick, just log-in!